The December 2007 timetable change brought new engines and a new livery for the ALEX trains. gone were the unsatisfactory mustard and silver painted locos and white coaches, replaced by locos and coaches in a smart blue, white and yellow colour scheme. 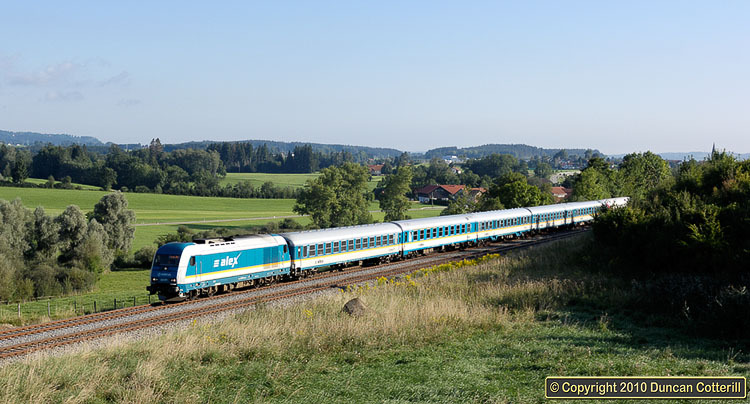 223.071 headed south towards the mountains with ALX86206, the 06:51 from München to Lindau, at Herzmanns on 24 August 2008.